Whether you are at home or on a vacation, flowers are always admired and appreciated. If you are a flower lover, then don’t forget to visit Pak Khlong Flower market. It has an amazing variety of orchids, roses and other flowers. In the evening, you will find many Thai florists purchasing flowers for their shops. Primarily, it is largely fresh fruit and flowers that are sold here. The place is a little far from the usual tourist attractions and is not often crowded. However, this is a plus point for tourists who want an authentic Thai experience and avoid the craziness of the swarming crowds. Mornings are the best time to visit. Bring money in case you wish to buy flowers. Bargain hard to get a good deal. 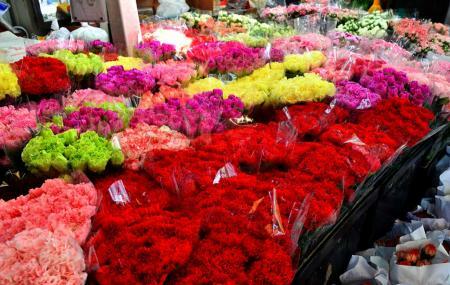 How popular is Pak Khlong Flower Market? People normally club together Wat Pho Reclining Buddha and Tha Tien Pier while planning their visit to Pak Khlong Flower Market. Very strange and antique place, excellent for any kind of travellers. The best hours to visit is closer to sunset as it will be cooler and less crowded. Also can be great for couples 💓💓 and combining with temple hanging out. If you're looking for the most beautiful colors and best smelling area in Bangkok, this is the place for you. As you walk through this gigantic area of flower stalls and see how hard people work, you really get an appreciation of the way of life people have. You also, well at least for me, have an appreciation of having eye sight and being able to smell and see all the beautiful types of flowers. Behind the market is a small retail area called, "Riverwalk" that have places to eat as well as a Starbucks and Boots pharmacy. Next to the flower market is also a vegetable market. Once again, one can appreciate how hard people work by loading and unloading product from the trucks in order to make a living. Big flower market. You can find almost every kind of flower with cheap price here.